Rick, Michonne, Glenn and the rest of the crew are back (along with lots of walkers, zombies or whatever the kids are calling them these days), in 2013 Cryptozoic The Walking Dead Comic Trading Cards Set 2. Based on the comic book and not the TV show, the base set switches focus from the first series but the main chase element remains the same. The 2013 Cryptozoic The Walking Dead Comic Trading Cards Set 2 base set switches from interior comic art to the covers. 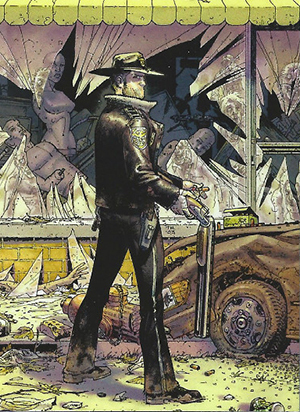 Drawing from more than 100 issues, they will include images not used in Series 1. This will add a lot more color, something that was missing the first time around in the base set. As with all comics, covers often deliver some of the most powerful artwork as well. The base set has 72 cards and has Foil and Printing Plate parallels. Sketch cards are once again the central chase element. More than 75 different artists are contributing original artwork for the set. Sketch cards are inserted one per box. 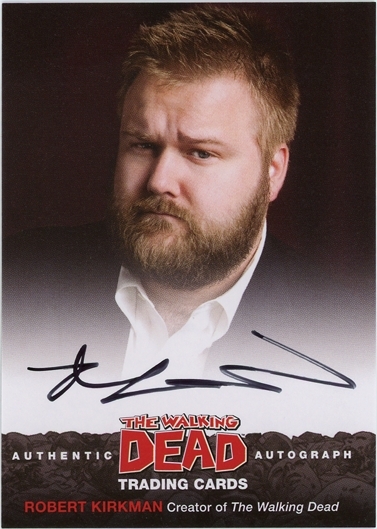 Collectors can also look for autographs from Walking Dead creative minds Robert Kirkman, Charlie Adlard, Rus Wooton, and Sean Mackiewicz. 2013 Cryptozoic The Walking Dead Comic Trading Cards Set 2 has a pair of basic insert sets, both of which fall two per box. 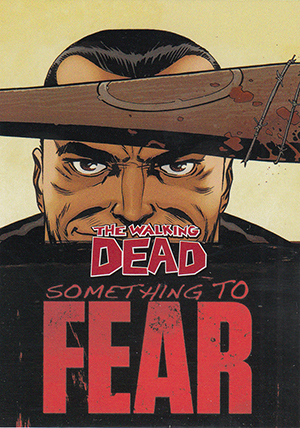 Quotable takes some of the greatest lines from the series.Something to Fear focuses on the events surrounding the 100th issue. 4 cards. Inserted 1:576 packs. Sketch cards inserted 1:24 hobby packs. 51 redemption cards inserted in hobby packs, each good for an oversized sketch card. Good: Great images, quality sketch cards throughout, vastly improved over the first series. Bad: Checklist leaves gaps in covering all comic covers. The Bottom Line: Talk about your huge improvements. The first set of trading cards base on the Walking Dead comics was largely disappointing. 2013 Cryptozoic Walking Dead Comic Trading Cards Set 2 is anything but. And while the promise of one sketch card per box is still a huge draw, this is a much more rounded release. 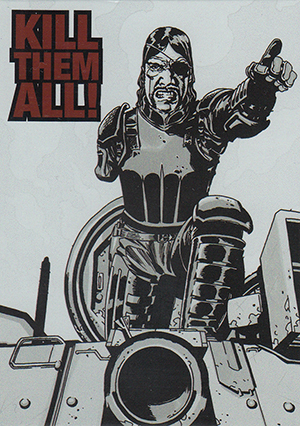 A big part of the problem with the first Walking Dead Comic set was the base cards. They used black and white images that were often disjointed and tough to understand unless you'd followed every issue. Set 2 wisely switches to the covers. Right away, there's color. Also, cover images are usually some of the most striking in the entire book. Card backs give a brief synopsis allowing collectors to get the finer points of the first 100 issues. That said, they're still no substitute for reading the actual comics. The rainbow foil parallels add a lot. They do a great job of further highlighting the already strong images. They have a lot more pizzazz than the basic foil parallels many other entertainment sets have. The basic inserts, Quotable and Something to Fear, don't use much in the way of printing enhancements (Quotable has a bit of red foil to highlight the featured quote), but they do compliment the base set nicely. As with every Cryptozoic release that has sketch cards, the artwork is astounding. The level of detail and varied styles on the large crop of artists is excellent. I love the idea of using covers to represent each issue. But the base set has 72 cards (71 if you don't count the checklist) while summarizing the first 100 issues. That leaves several gaps. It would have been nice to have a full run of covers, even if that meant changing the base set configuration a little. Then, if the title remains hot, a new series could be added every couple of years. With all the variant covers, it might even be sooner. Either way, I hope this is a living set that continues to grow. As mentioned, the roster of artists contributing to sketch cards is vast. This is good in a lot of regards. It makes for good variety. It should also keep the number of cards per artist somewhat low. Monetarily, much of the box's value is going to come from the sketch card. And while not all are created equal, Cryptozoic maintains some of the highest standards in the hobby for when it comes to original art cards. Although the odds are long, 2013 Cryptozoic The Walking Dead Comic Set 2 also has some bonus hits in the form of creator autographs, redemptions for over-sized artwork and printing plates. I thought the basic inserts are lacking a little, but the rainbow parallels make up for it somewhat. And let's not discount the base set that is nice to pour through. When the first comic set came out, speculation was high based on allocations. As a result, prices soared. This release is more in line with where collectors might expect it. This is a tremendous set for existing fans of the comic as well as those who like the show but haven't gotten caught up with the books. It brings stellar artwork, a strong configuration and lots of violent zombie goodness. David McIntosh � The checklist would be #72. Is it not numbered? The checklist is not numbered. I had the same question as David. Danny Silva and Marco D. Carrillo have same skecth card. I’m not sure which one I have. 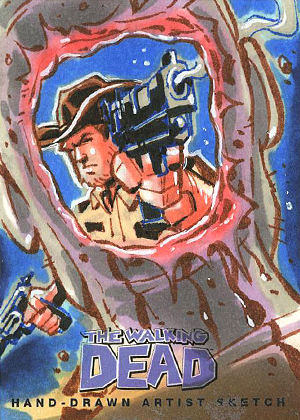 I have a skecth card from walking dead 2comic Series. Danny Silva and Marco D. Carrillo have same skecth card. I can’t tell which one I have. How can I tell which one I have? I have an Irma Ahmed sketch card from season 2 Walking Dead, How can i find out what its worth? Jeff Riedl � Comparing it with completed eBay auctions is your best best. CRYPTOZOIC WALKING DEAD SERIES 2 (comic) TRADING CARDS HOBBY SEALED BOX!